Hydrogen peroxide (H2O2) is commercially produced by catalytic oxidation of anthrahydroquinone, which is energy-intensive. Electrochemical production of hydrogen peroxide production through oxygen reduction reaction (ORR) is a sustainable approach, primarily due to its significance in energy conversion systems such as fuel cells. Low temperature fuel cells use graphite as a cathode for H2O2 synthesis. 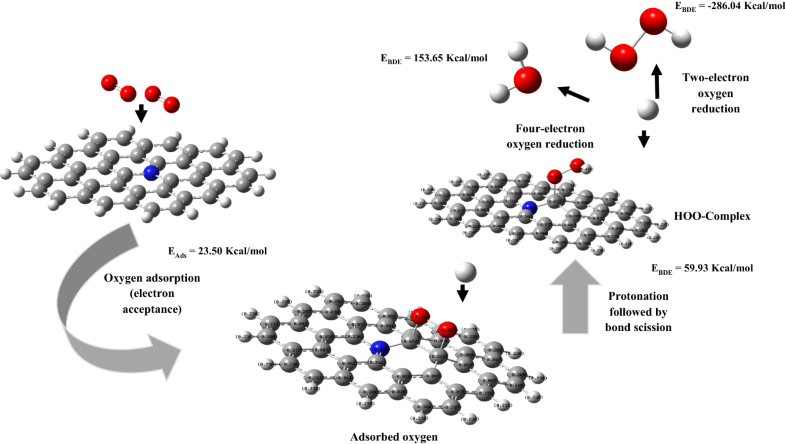 However, the catalytic activity of a graphite cathode for a two-electron oxygen reduction reaction must be improved. Nitrogen doping is an efficient approach to modify the electrochemically active surface of the graphite cathode. Therefore, quantum chemical approaches are essential to comprehend the molecular nature of the processes at the cathode. DFT/B3LYP/6-31G* method was employed and bond dissociation energy (BDE) analysis was performed to determine the feasibility of H2O2 production at graphite and nitrogen-doped graphite (Graphite-N) cathodes. According to the suggested mechanism, oxygen adsorption is the first step of the ORR. Calculated values showed that with energy value of 23.50 kcal/mol oxygen adsorption at the Graphite-N cathode is energetically more favorable than the graphite cathode (Ead = 65.08 kcal/mol). Considering the ORR mechanism, a second-electron oxygen reduction is identified as a key step for both H2O and H2O2 production. Therefore, BDEs were compared at the second-electron oxygen reduction step. On average, − 320.92 and − 286.04 kcal/mol of BDEs for graphite and Graphite-N cathodes showed the feasibility of H2O2 production at the Graphite-N cathode. The results are in agreement with the literature. Thus, it is concluded that nitrogen doping of the graphite cathode increases the feasibility of H2O2 production. 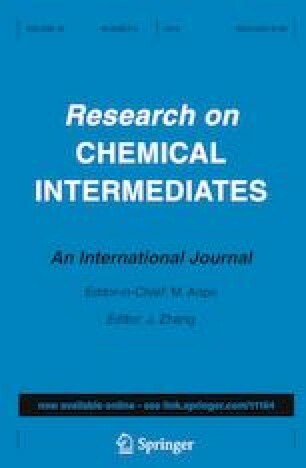 The authors are grateful to the University of Malaya Postgraduate Research Grant (PPP PV139 2012A) which financially supported this work.